Building a luxury Gite in France, and how speaking French would help. “You must go and visit the Mayor”, they said. “If you don’t go he will be annoyed with you forever and you will never get anything done”, they said. 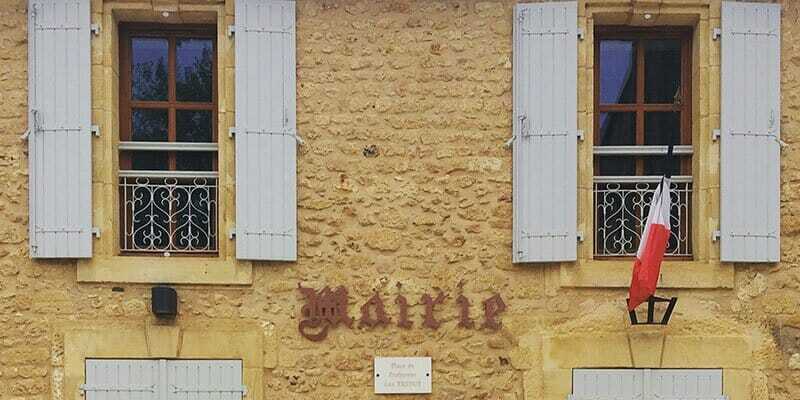 In France, every village has a Mairie. It is normally the biggest building in the village, right at the centre proudly flying the Tricolore. Monsieur Le Mayor is a powerful man. He is in charge of everything that happens in the village. You need him to be your friend. This is particularly true if you are a couple of Brits buying a derelict Mill with big plans and no mains water. That’s right – we bought a house that is not connected to mains water. Not a problem we thought, how hard can it be to get connected to the mains supply? And anyway, we have a spring (yes, we have heard all the Peckham spring jokes). If all else fails we can sort something out, can’t we? How difficult can it be? Answer: very, very bloody difficult (but more of that later). You also need to speak to Monsieur le Mayor if you are planning a change of use to a building. A derelict Mill into a top-end luxury gite, just for an example. So, we needed to see the Mayor. According to people, who are apparently very experienced in this sort of thing, we needed to take him a present from our home country. We had clearly come unprepared; we hadn’t bought a miniature red bus or an “I heart London” T-shirt, we had bypassed the British-tat shop in Stansted. So we went to the local Intermarche and bought a bottle of Scotch. Another slight problem; Monsieur le Mayor does not speak any English. Nothing. Not a word. I did French at A-level, a “few” years ago. I spent some considerable time on Google translate and formulated my speech. It was to involve telling him that we were going to make “une grande gite” – the preferred answer was “oui” and/or “bonne idee”. Then we were in the clear. We also needed to raise the issue of no mains water with him and see what he said. How hard could this be? We were instructed not to ask him any questions. Off we went to Le Mairie, with the contraband Scotch weighing down my, fortunately, huge handbag. What ensued is possibly the most toe-curlingly embarrassing ten minutes of my life, only just topped by Lucy Blythe treading on my tail when I was a dormouse in a school production at 8 years old, and falling on my arse. We walked into Le Mairie and I boldly asked whether it was possible to see le mairie? The girl behind the desk glanced up from watching cat videos on Facebook to look at me in a very confused way. I repeated the question. Again, a befuddled look, accompanied by a slight shrug. I asked again, starting to sweat slightly now. She sniggered slightly and told us that Monsieur le Mayor (emphasis added) would be back at 11 am. We went for a walk to kill 10 minutes and it occurred to me that I had actually just asked whether I could (a) marry Monsieur le Mayor or (b) marry her or (c) marry my husband. This wasn’t a good start. At 11 am we went back and Monsieur le Mayor was there. My mind went blank and my carefully prepared speech went out of my head. My husband took a distinctly back seat (out of the door). I managed to mumble that we were going to build une grande gite and I got a nod and the required “bonne idee”. Job done, I thought. Let’s get out of here. The penny then appeared to drop with Monsieur that we were the nutters who had bought Fontalbe. The massive mill – without water. I was then subjected to a lengthy, technical speech about source water, mains water, who we could speak to, where the pipes would go, where the unicorns nested in our forest (it might as well have been). All in a strong Perigordian accent and all without actually opening his mouth. I had no idea at all about what he was saying. I did not understand a single word. I valiantly nodded and smiled a bit and said oui and ‘d accord a lot. At this point, a queue had built up behind us with proper French people with proper things to do. It finally ended and I smiled again, backing out of the office. My husband, who had snuck back in to witness my humiliation, nudged me and pointed at the bottle of scotch in my handbag. Oh. God. I pulled it out and presented it to Monsieur, telling him we had a present for him. He looked slightly aghast but took the Scotch. My husband swears that he heard his assistant say that what we had done was totally inappropriate. By this time my humiliation was complete and I ran away. We sat, in silence, for about 10 minutes. Husband: I don’t think that went very well, did it? Husband: I think we need to work on our French? We haven’t seen Monsieur le Mayor again, not that I would recognise him through my blur of embarrassment. We are going to invite him to our opening party…and give him a glass of scotch mixed with mains water. We are working on our French.